Is the first evidence of life on Mars. In a rather odd scientific study, NASA has suggested that a rover has found Mushrooms on Mars. 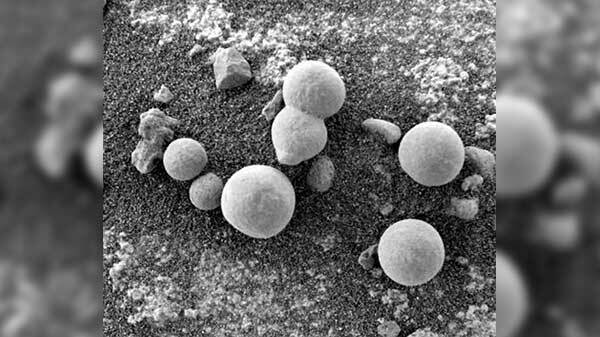 Published in the Astrobiology and Space Science Journal, the study claims that bulbous objects on Mars surface which might be puffballs. Unfortunately, this isn't evidence of life on Mars. Many observers are skeptic about the study and the journal. NASA has its own theory about the lumps. Researcher Dr. Regina Dass told The Express, there aren' t any geological or other abiogenic forces on our planet which can produce sedimentary structures, which look like a mushroom, stems, stalks, and look like spores on the surrounding surface. 'In fact, fifteen specimens were photographed by NASA growing out of the ground in just three days.' But the space agency has rubbished the claims, saying the bulbous shapes are a mineral, haematite.